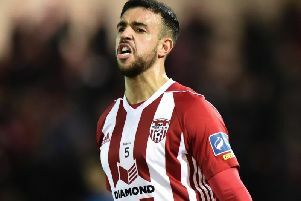 KENNY SHIELS had expected Derry City to break into the top three this season but on Friday night the Candy Stripes’ boss reluctantly raised the white flag in the race for third spot. Waterford have enjoyed the upper hand over Shiels’ troops this season, winning three out of four encounters and this latest win over Derry saw them move EIGHT points clear of the Brandywell outfit. With just seven league matches remaining in the 2018 Airtricity Premier Division campaign it’s safe to say the Blues won’t be caught by a Derry City side which hasn’t won back-to-back league games since early April. It’s been a season of inconsistencies and after successive league defeats at home, Shiels knows there’s too much ground to make up as he conceded defeat in his bid to pip Waterford and Shamrock Rovers for the third European spot. Alan Reynolds’ men were full value for their victory with a ninth minute goal from Dessie Hutchinson and a deflected Gavan Holohan strike on the stroke of half-time enough to see off the home side despite Dean Shiels’ first goal for the club which levelled matters on 31 minutes. Derry’s defensive frailties were once again exposed but Shiels was frustrated as he felt it was a missed an opportunity with fourth placed Rovers losing another Dublin Derby at Tallaght. My expectations and ambitions are to be up around the top three and now we’re not going to make the top three because there’s too much to make up you would think. The only hope of achieving European qualification for a third consecutive season under Shiels is through the FAI Cup or should the league winners also lift the blue riband trophy - a scenario which provided Derry with a pathway to the Europa League last year. In fact since 2010 fourth place has been enough to clinch European qualification and so Shiels will be hoping for a strong finish and a quick turnaround in league results. “My expectations and ambitions are to be up around the top three and now we’re not going to make the top three because there’s too much to make up you would think,” said Shiels. “I have to say they were a really good opponent and we can’t really complain. We’ve got a cup game next week and it’s about dusting ourselves down and getting on with things as best we can. “We were beaten by a team who were better than us in the first half and I thought we were better than them in the second half. They are a very good team with very good players and, overall, we can’t have many complaints because I felt the boys didn’t perform as well in the first half. Shiels may have had ambitions to challenge league newcomers, Waterford for third but the City manager isn’t surprised the Munster men have maintained their lofty position given the talented team they’ve assembled. When it was put to him that Waterford’s rise to the top in their first season back in the top flight was ‘remarkable’, Shiels claimed it was only to be expected given they had ‘cherry-picked’ some of the best players in the league. “The array of talent they have invested in, they are justifiably and rightly so up at the top of the league behind the ‘big two’. “When you lose you are always disappointed. You have to give them credit they are a good team but they’ve made huge investments. “It’s not remarkable,” said Shiels. “It’s expected to happen with those players and they should be up in third position, I think they’d admit that themselves with the array of talent they have. So with a third place finish out of the question Shiels must throw all his eggs in the one basket and hope the cup can salvage an overall frustrating league campaign.